Ebay has been full of bargains lately. Picked up a KTM EXC rear fender with indicators (turn signals) for $20 within 5 mins drive from my house. Previous owner of my bike had broken the originals and fitted small amber lights intended for a truck or trailer. It was a neat job and less prone to damage in the bush but non-compliant for registration so I was very glad to find replacements cheaply. I rent factory space from a friend that runs a Vehicle Inspection (Roadworthy) business. After installing them my buddy said "Nice job, but I would have written you a roadworthy anyway". I luckily found a replacement for my cracked rear yellow plastic fender in good condition on Trademe.co.nz picked it up for $55 NZD now just waiting on it to arrive. Then went to the local tip which runs a recycle shop and found a black KTM/Acerbis front fender which they gave me for $3! Yesterday I scored a 2005 fe650 complete head and cam (which I assume is the "08" cam). My earlier post referred to an ebay auction in the USA for one that had been repaired but I got lucky with an Australian listing for about half the price. I also scored the front and rear plastics from the same ebay seller although they are the reverse colours to my bike so I'll mix and match if need be. He also has a B&B bash guard going cheap which I'll pick up next week. Also tempting to get the Akropovic system but I can't justify the spend on that just yet. Narrowly missed out on a KTM steering damper for $260. Decided I MUST have one for safety. I'd prefer a Scott's/Öhlins just to keep the bike as Swedish as possible. And Steg Pegz. Been picking up a bit more riding gear too. My work colleague's husband has lost about 40kg and had to buy all new gear so I got his Rallycross II jacket. Just need boots now. Once this head arrives I can start ordering parts for re-assembly! Getting excited. I'm a fan of the Scotts, have have them on both Bergs. 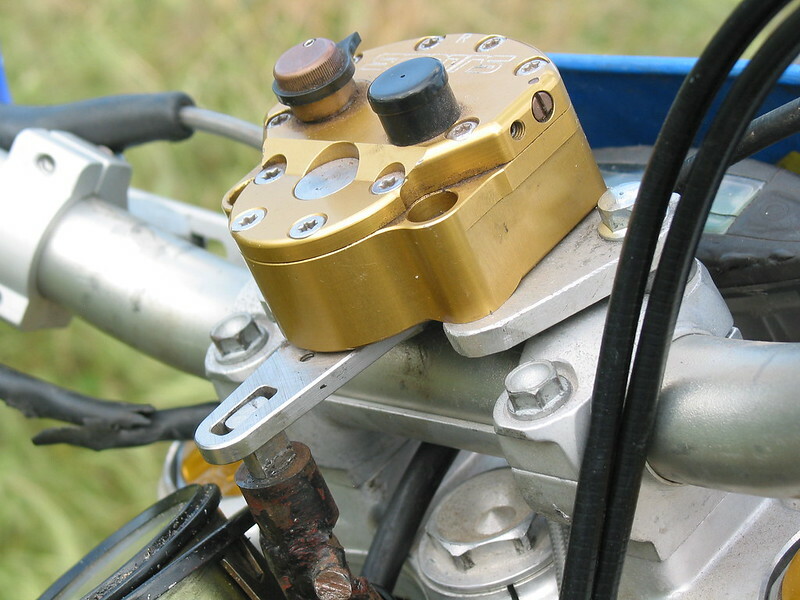 But the old 501 gets little use so its one migrated to a DR.
One of these Universal Motorcycle Steering Damper Stabilizer | eBay turned up in the mail the other day, as yet untested, but looks and feels identical to the original, so I have another ordered for another project. I'll probably disassemble it and replace the fluid with known stuff and it'll do the job. I can't really recommend them yet, but at the price I couldn't resist. that looks awesome steve thanks for the link. does it have return to centre damping like the road model scotts ? Yep, both ways, but as I said, as yet only unpacked so actual performance TBC. It feels a bit stiff, but that's just playing with it, and will likely loosen up a bit with use, but also one reason why I think I'll change the fluid. Superfically, the only difference from the original is the lack of an engraved moniker. Externally, its otherwise identical, looks the same as the original, so if inside and clearances match up, its a bargain. PS, also has adjustable sweep like the original. I'll grab one of those next pay! Would be easiest to just get a Scott's mounting kit and probably go for a weld-on. I suppose I should add that the dampoing both ways is best suited to open fast going, sand etc. The non damping return is better for terrain like single track where you want to turn quickly. I had hoped to get some pictures to go with this update but my phone was flat last night by the time I made it to the factory where my bike is stored. Recently I've purchased more bling parts for a bike that as yet doesn't run. Just can't help myself. The other thing of note is the different shaped combustion chamber. Hard to say if this will have any effect on compression ratio. I haven't removed the valves or conical valve springs from it yet although they don't look as though they are recessed into the seat (or "tulipped" as some of you say). The 08 cam is in excellent condition and was the primary reason I bought the head. The ADC stopper looks as though it has very slightly dislodged and was at risk of coming out (will mig weld that pronto as I've seen others do). I also made it out to the nearest Tool Hire and checked out the Enerpac hydraulic port-a-power. They rent it for $110 per day. Had to size it up before making the press frame but at least I have salvaged some scrap steel for that job now. The Roc Stompa damper kit came cheaply at a buck but I can't be certain if that ebay damper is going to fit it - haven't yet measured it properly. Although it was advertised for a Husaberg the collar is just slightly undersized so I'll have to send that off to be CNC machined for a good fit or just move to a weld on. I'll also need to change the bar risers to match the upper bar clamp which has two bolts per side whereas my bike has four bolts per side. Let me know if there's a bike getting wrecked with any of those bits! I would require the cost of shipping if you want it. but no charge for the new part and harness. Let me know if you can use it or it helps?